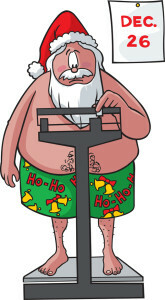 Most of us have had the weight loss or fitness frustration during this time of the year. Here we are struggling all year to do well and then the Holidays come around. All of a sudden there are Christmas parties everywhere, the end of the year work stress, kids and partners being sick, we are low on cash because of bills and Christmas gifts. It is the season that probably puts on the most pounds on people. The stress, the food and the time restrictions make it seemingly impossible to make it through. Here is one thing, being frustrated with yourself does not make it any easier, quite the opposite, the likelyhood of you eating more food, especially comfort food rises. We are all aware that this is coming around, most of us have seen it for a couple of decades (including the weight gain). If you have gained weight until now during this season, be okay with it. It is not like the weight drops right away if you are mad at yourself right, and I am sure you have felt the hunger cravings for chocolate or other comfort foods during that time when you are mad at yourself. Now it is easier said that done. If you are mad, then you are mad, right? Well, kind of. It has actually shown that people active pursue some self compassion, like in the form of saying to yourself: “It is okay that I have eaten too much, most people struggle during this time, I am not alone”, really seem to be doing better and compensating less with food afterwards. Some of us live in the future and always worry, some of us live in the past and feel eternally guilty for something. Accept your responsibility and move on. We all fail, all great leaders have failed in one way or another, the difference usually is that they are capable of moving on. It does not mean you don’t take responsibility but guilt tripping yourself for all eternity has not changed anything yet other than making you eat more and feel bad. Next time you make a mistake, may that be eating or otherwise, take responsibility, have some compassion for yourself and move on by doing differently again. Thomas Eddison once said: “I have not failed. I have just found 1000 ways that won’t work.” In the end he was successful.